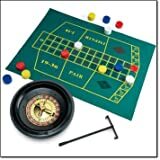 Includes roulette wheel with cylinder and cross, playing mat, 100 color chips, one dealer chip, plastic rake and two steel balls. Roulette wheel, 10″ diam. x 2 1/6″ H. Mat, 23 1/2″ L x 17 1/2″ W. ABS, polyester and steel. Imported.